Admittedly, there’s no way in iPhone to close all apps at once without using any Jailbreak tweak. IOS is not bothered by apps running in the background and frankly, neither should you. But of course, there might be reasons when you’d want to close apps on iPhone at once. So, , we’ll look at ways to work around this issue. First things first, before we discuss how to close all apps on iPhone, let’s see how we can know which apps are open and running in the background. Whenever launch an app in your iPhone or any iOS device, it remains open till you force close it. From the interface of an app when you go to Home screen, the app doesn’t close. It runs in the background while you roam around in your device or let it stay idle. App Switcher is an iOS feature that lets you look at the list of applications that are running in the background of your device. It shows you a list of all the apps that you’ve launched. Double tap the Home button to launch open App Switcher. There are many reasons you might want to close apps on iPhone. There is a common misconception that background apps use more battery. However, that isn’t true at all. On the contrary, it consumes more resources of your device to open an app afresh. So, in most cases you wouldn’t want to close your frequently used apps and let them just stay open in the background. But, if for any reason you opened all your apps, you might want to close most of them down. Also, sometimes you might suspect that an app is not working properly and your device may suffer due to that. But you don’t exactly know which app is causing the problem, so you could close all apps to try your luck. You can force close apps on iPhone one app at a time. Double tap on home screen to open App Switcher. This will show you a list of open apps. For iOS 9 and above, tap and hold an app and swipe it up with multiple fingers. It will disappear from the list. For older iOS versions, you can tap on the button ‘x’ on top of icon for each app in App Switcher. If you don’t have Jailbreak on your iPhone, the best you can do is to close app on iPhone individually through the above method. Jailbreak users have all the fun and freedom. 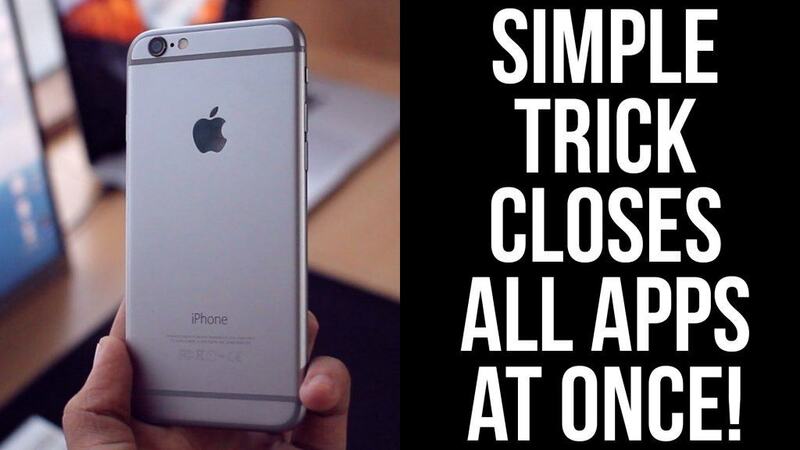 If you have jailbroken your iPhone, you can use SmartClose, a Cydia tweak to close all apps on iPhone. SmartClose is developed by Ryan Petrich and it lets you close all iPhone apps at once, much like you can do in android devices. Look for SmartClose in the list of tweaks and install it. Once installation is complete, you will see a new options panel in Settings app. Use the SmartClose settings panel to assign a simple gesture that you’ll use in future to close all apps in seconds. If you want to try an alternative, give a shot to ClassicSwitcher or SwitchSpring instead. Both are Cydia tweaks for Jailbreak devices. Keep it in mind though that if you want to close all apps in iPhone or iPad only to save battery time, it won’t be of any help.